Kalamandir started with "a vision to foster necessity and accessibility of arts and aesthetics in our day to day social life. Countering the mono culture, the venture looks for a creative, dynamic and diversified environment for the young minds among tribes and non-tribes of Jharkhand - who are fiull of finer senses." In doing so, it has not only revived the dying tribal arts, but also now supports 2500 families, and has built up a "social business venture" with a turnover of Rs.1crores. It was a visit to the workshop of an impoverished stone sculptor in 1980 that chiselled out Amitava Ghosh's mission in life. The young banker and amateur theatre artist had just arrived in Jamshedpur, then a part of Bihar. Three decades on, villagers in the Singhbhum-Kolhan region hail him as the man who has revived four dying art forms, bankrolling a clutch of struggling artists, providing livelihood to 2,500 families, and inspiring hundreds to live by their art. "I met this sculptor named Guntha Laik on a visit to Chandil village. He had lost his house and farmland to the Subarnarekha dam project," Ghosh said. Moved by his plight, Ghosh started making regular trips to Chandil to explore ways of aiding Laik. "I tried to help him with funds, but couldn't do much." The failure haunted Ghosh, then a 21-yearold fresh out of Kolkata's Scottish Church college, for years. His chance for redemption came in the mid- '90s, when he learnt about the dying tribal metal art of Dokra. "I visited Chakulia's Bend village to meet the last surviving Dokra artist. Phatik Rana had recently given up the trade to earn his living by working in farms," said Ghosh. "It was depressing to see an artist working the plough." It took Ghosh five years to goad Rana back into his trade. 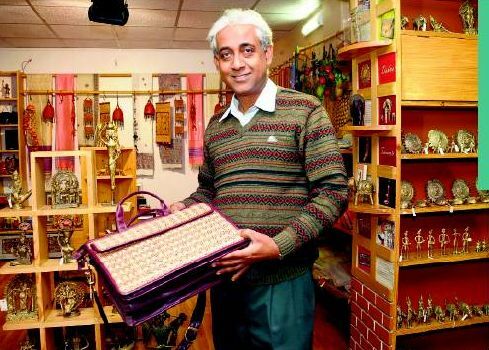 Today, Rana is recognised for his skills - his products fetch him up to Rs 9,000 per month - and he is an icon for a generation of younger artists. In his village alone, more than 100 youngsters now make Dokra and earn almost as much as Rana does. Ghosh also walked an extra mile for Kedar Nath Sahu, the Chhau dancer of Saraikela. The art, once the toast of tribal performances at the Rashtrapati Bhavan and stages in China and Russia, tottered on the brink of extinction while Sahu himself was plunged in poverty. Ghosh got Sahu to draw up a blueprint for a profitable revival of the mask dance. In 2001, he organised the first Chhau Mahotsav - the pivot on which the dance made a turnaround. Ghosh subsequently set up the State Chhau Centre at Saraikela to lend institutional support to the artists. Sahu, meanwhile, went on to bag the Padma Shri in 2004. Ghosh took up another challenge - the revival of Firkal, a traditional war dance. He trained Potka village's womenfolk to make products from grass and bamboo to support their dancer husbands. Over the last four years, more than 500 wives have coaxed their men to perform Firkal and leave the earning to the women.